Marisa's Pieces: O.M.C. OH MY CLOCHE!! So do you know what my wire cloche is? It is a wire trash can from Dollar Tree. I buy so many of these when they have them. I got the idea from The Gathering Place Design.I will have to show all of you the other ones that I have made. I bought the bunny from Dollar Tree and glued a little pink bow on her. 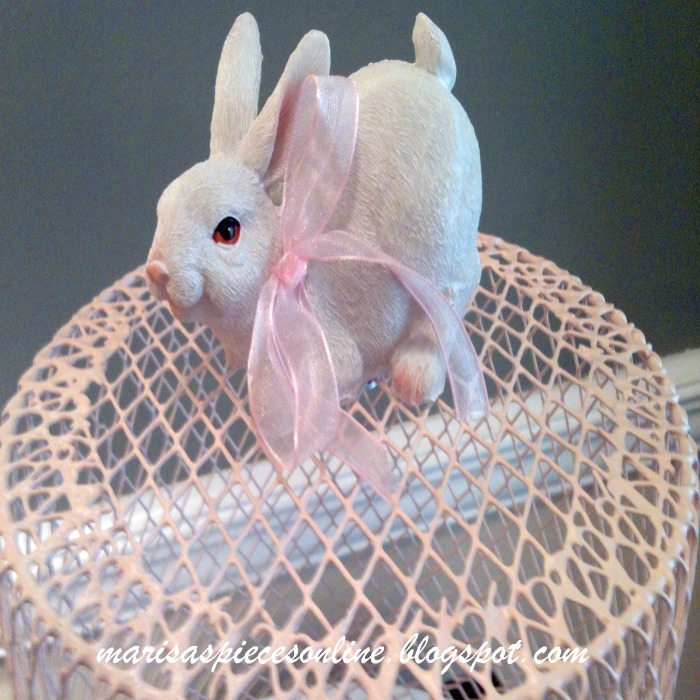 I drilled a hole in the bottom to attach the bunny to the basket and I spray painted the basket using Pink Ballet Slipper from Krylon. I had the charger that it is sitting on and I primed it, painted it white and used the crackling finish on it. Look at these happy little babies. So cute!!! How clever and how adorable! I love it! LOVE this!! New follower! Stop by shabbgals.blogspot.com for a visit when you get a chance! Very cute! Never thought of using a wire trash can before. Very Clever! The rabbits are adorable, and such a good idea! This is so cute! I love your bunnies. Thanks so much for visiting The NY Melrose Family and leaving such a sweet comment. I'm following via gfc and lf. 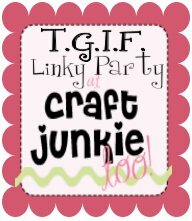 I host a weekly link party on Wednesdays and I'd love for you to join in. Oh, that is sooo cute, it is so Easter darling! I love pink ballet slipper! You are brilliant! I seriously have this trash can! I would never have thought of doing this! Awesome! Wow! Another really great idea! 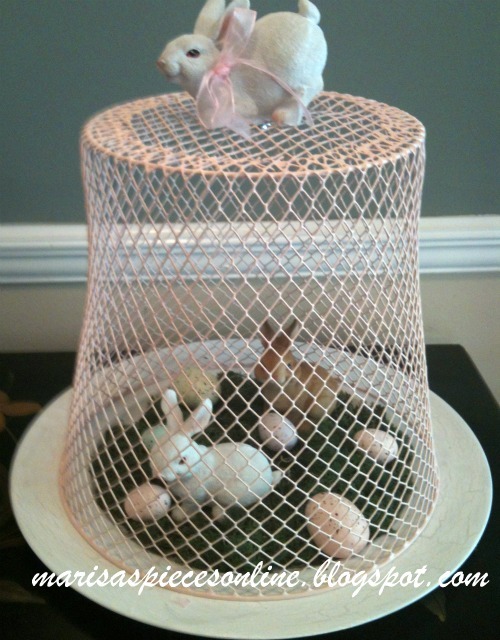 That little bunny is just adorable, and I love how you made that basket into a cloche. How cute! You are brilliant to do that. Inexpensive and adorable too. Love it. 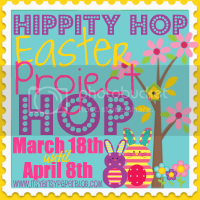 I hope you'll link this post up to my Hippity Hop Easter Project Hop. I love this idea. I checked out the Gathering Place also. I hope my Dollar store has some of these!!! Very cute...I did the same thing a few weeks ago. How can you beat it! Happy Easter. Very cute and creative! Thanks so much for sharing at The Creative Spark. I'll be posting this on my Facebook page. Wishing you a Happy Easter! Ha! 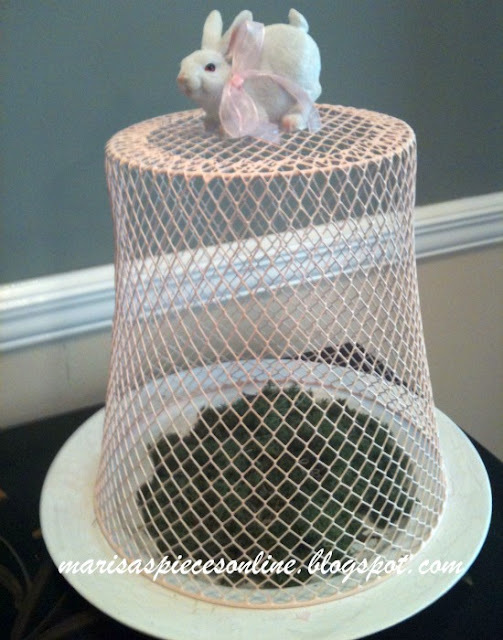 I love your "wire cloche!" So smart! Thanks for sharing at oopsey daisy! Marisa! This is adorable (and thrifty) Totally up my alley! That's a really great twist to the cloche! 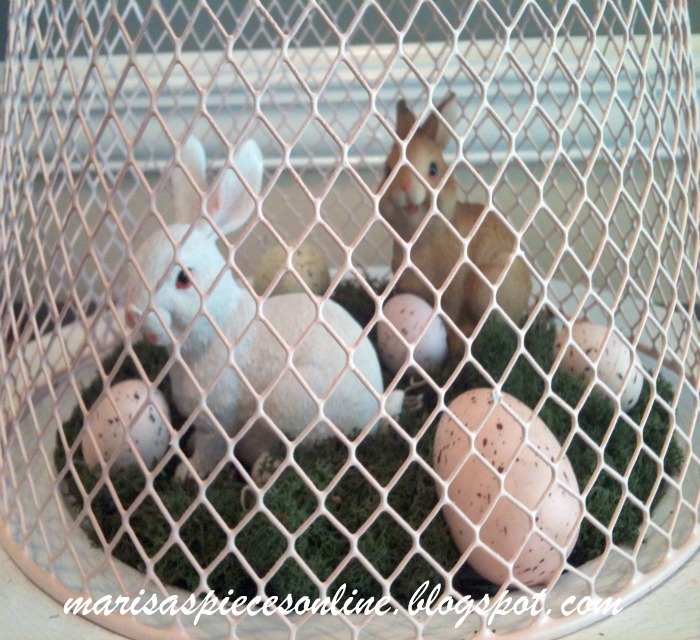 I must say, that's a very devious little rabbit trapping the other ones under the cloche, hehe! Seriously, it looks adorable!